Ok ladies (and guys) here's a real tear jerker! Be sure to have a box of Kleenex nearby. After having a really yuck day I decided I needed a good fun movie to end the day with a smile or two. So after work I stopped by my local Redbox kiosk. Don't you just love a bargain - only a dollar for a movie! My kind of shopping! 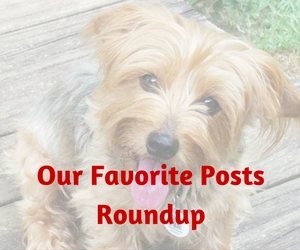 since it was about a dog and those kind always have happy endings. Not to mention Richard Gere was the lead actor. Sounded like a good night to me. Later that evening I settled on the couch with Kirby snuggled by my side and began watching the movie. A good story with good acting. It was advertised as being based on a true story so I kept waiting to see this dog do something heroic, maybe save someone's life? WARNING: IF YOU WANT TO SEE THE MOVIE YOURSELF THEN STOP READING THIS BECAUSE I AM FIXING TO SPOIL THE ENDING FOR YOU! The short synopsis is it's about this American guy, Parker, and dog who form that rare, invincible bond. Parker takes the train into the city to work and then back home every day. One night he discovers a lost puppy at the station and takes it home. 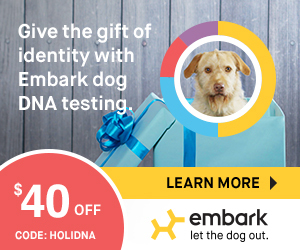 He attempts to find the owner which proves to be unsuccessful so then he advertises for a home for the puppy. Of course in the end he keeps the pup and names it Hachi. Soon Hachi begins following him to the station each morning. Then Parker finds Hachi at the station waiting for his return. From this point on the townspeople would become used to seeing the two walking to the station together each morning and then seeing Hachi patiently waiting at his same spot each evening. This continues until one day Parker doesn't return home because he has died. Still Hachi continues to go to the train station and wait for him every evening. By now the tears were rolling down my face. Kirby actually climbed into my lap sensing something was wrong. But the story doesn't end there. Hachi loved this man so much that he refused to even consider a new master. Is your heart breaking yet? Hachi would continue this vigil for the remainder of his life. That's what I call a never-ending love story! The next day I did a search of this Hachi to find the true story. Usually the remake of a "true" story can turn out to be quite different than the actual truth. When I read the true story I cried some more. Following is the true story of Hachi, an Akita, who demonstrated such loyalty only few have ever witnessed. 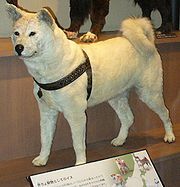 Hachiko, a white male Akita dog, was born in Odate, Japan in November 1923. At the age of two months, he was purchased by Professor Ueno who lived in the Shibuya district of Tokyo. Hatchiko and Professor Uyeno were inseparable friends right from the start. 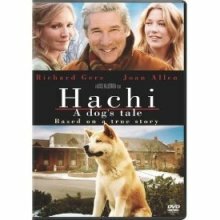 Each day “Hachi” would accompany the professor to the train station when he left to go to work at the Tokyo University. Upon returning, the professor would find the dog patiently waiting, tail wagging. This happy routine continued until tragedy struck on May 21, 1925 when Dr. Ueno did not return because he had suffered a stroke and died at the university. Hachi was eighteen months old. After Professor Ueno’s death his wife sold the house and moved away. Hachi was given to family and friends but he routinely escaped showing up again and again at his old home and the train station. Eventually he must have realized that the Professor no longer lived at the house and stopped going there. This continued for almost nine years with Hachi appearing precisely when the train was due at the station to wait for his beloved master who would never return. Nothing and no one could discourage him from maintaining his nightly vigil. As time passed the professor’s old gardener who lived in the town provided Hachi with a home even though he would stay near the train station for days at a stretch and the Train Master further provided an accessible storage room with a bed and water at the station for the waiting dog. The townspeople and the many people who frequented the Shibuya train station, both those who had seen Hachi and Professor Ueno together and those who later heard his remarkable story, brought him treats and food to nourish him. On March 8, 1935 at the age of twelve years, Hachi’s long wait for his beloved master ended when he died on the very same spot he last saw his friend alive. Kirby is already two years old and patiently waits for me to return home each day from work. Hachi was only eighteen months old when his sad journey in life began. He patiently and purposely waited almost nine years for this one person he loved so much. I've heard it said all dogs go to heaven. I have to believe that God surely rewarded this great demonstration of unconditional and unending love by reuniting Hachi with his beloved owner. By the way, did you run out of Kleenex?